It seems I can’t help myself. As long as there is fresh summer fruit to be had, I’m going to go ahead and bake with it. It’s just so gorgeous, you know? So full of juice and sweetness! You understand? Gorgeous, tender, juicy little things. …Did that sound dirty to you? Get your head out of the gutter. Jeez. Instead of putting apricots in a galette or raspberries in a brownie, this time I decided to put some rustic into a peach cake. On account of the recipe I saw in an old Cook’s Illustrated Magazine. You guys read that rag? Extremely thorough and excruciatingly meticulous. A baker’s dream of a publication. And they have peach cake! 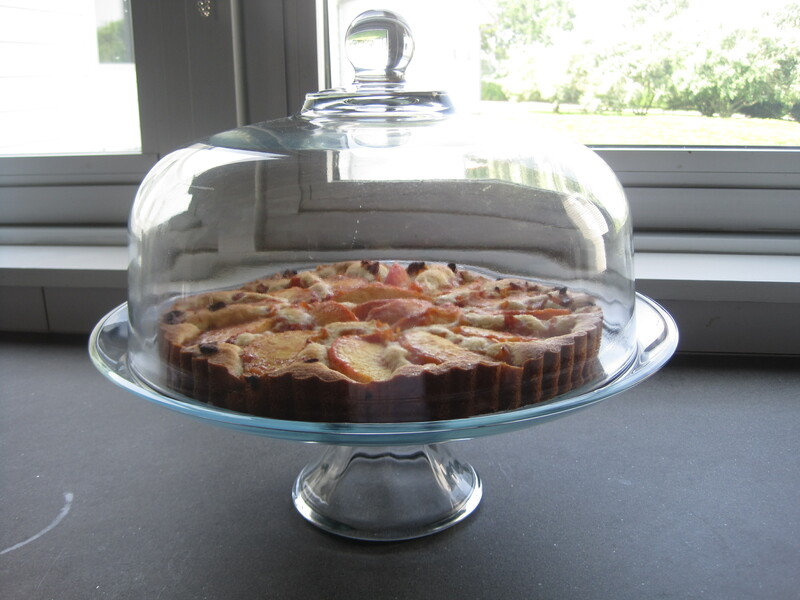 This one uses lots of fresh peaches (obviously), and also gets some help from a bit of finely chopped dried fruit, which absorbs some fresh peach juice (leaving the dried fruit wonderfully plump and tender) and helps to keep the cake from getting all sogged up. Very clever. Good on you, Cook’s Illustrated. I used dried apricots because they were easier to find than dried peaches, but, as the saying goes, I think a stone fruit is a stone fruit is a stone fruit. Probably. Preheat oven to 350 F. Lightly grease a 9-inch tart pan (you could also use a springform pan, if you like). Combine the sugar and cinnamon in a medium bowl. Set aside 2 tablespoons of the mixture (to use for topping the cake). Add the peach wedges to the remaining cinnamon-sugar mixture and toss to coat. In a medium bowl, whisk the flour, baking powder and salt together. In the bowl of a stand mixer fitted with the paddle attachment, cream the butter and sugars on medium speed until light and fluffy. Add the eggs, one at a time, and then add the sour cream and vanilla and beat to incorporate. With the mixer on low speed, add the flour mixture and mix just until the batter is combined. Pour the batter into the prepared pan and spread it around evenly. 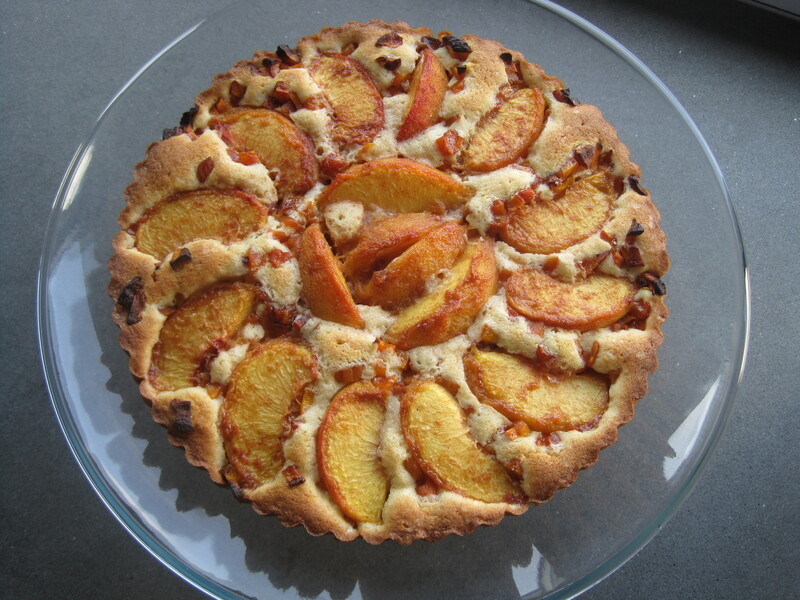 Scatter the dried fruit over the batter, then arrange the peach wedges in a circular pattern on top of the cake. Sprinkle the peaches with the reserved cinnamon-sugar mixture. Place the tart or springform pan on a larger sheet pan (to catch any juice drips) and bake for 35-45 minutes, or until a toothpick inserted in the center of the cake comes out clean. Allow the cake to cool for about an hour before serving. The cake can be stored (well wrapped) at room temperature for about 2 days. Ummm yum? Peaches are defs one of my fave fruits. Fresh fruit baked into things is what summers all about! I say we embrace it (not that I don’t like fresh fruit) – but I mean, theres only so many ways to eat fruit fresh before you have to start baking it- totally different flavours! Pretty! Is it as delish as the cobbler?